handle. Bought from the Hello! Project Information Village in Waikiki, Hawaii around 2005. 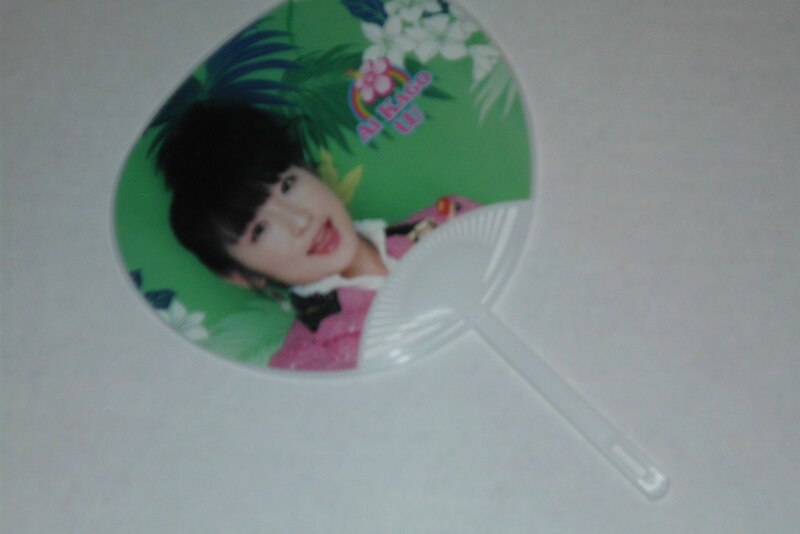 This is a very cute item, and Kago still had vestiges of her pedoliciousness at the time these were released. As far as fans work, this does work – wave it vigorously enough and you’ll get a nice small breeze directed your way. I can say the same things about the bumper stickers, though. Or the photographs. So let’s face it – this is for Kago lovers who want something different from just a plain photo, practical uses be damned! Be a fan with a fan! You can stick it with your H!P pens and pencils and chopsticks in a big circular pen holder or something,and it’ll still stand out! And it’s also a great reminder of when W was still poised to conquer the idol world – which we all know was just a matter of time.